LandShape works together with local communities to provide facilities for local people. This can include working with local groups to identify projects which are needed by the local community and then to investigate methods for funding by grant applications to organisations such as Big Lottery and Hanson Aggregates. Community projects are always most successful when they involve local people of all ages – giving a sense of ownership and belonging. LandShape can assist with identifying grants and funding, plus aid with preparation of grant funding application documents. LandShape can also provide community consultation such as preparation of design options, open events and information sessions, leaflet design and design development with children and residents. LandShape can work together with local people to carry out work on the ground, such as planting hedges, clearing vegetation and maintenance of facilities once complete. LandShape worked together with residents and the Parish Council to revamp the existing rather tired playground. 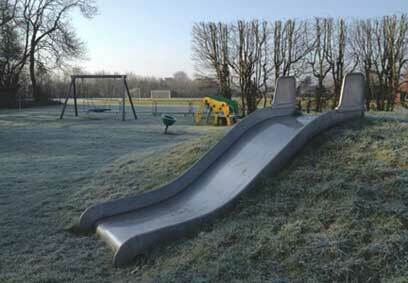 A new design was developed with Kompan to include rural elements such as slides incorporated in grass mounds with climbing frames and swings. A new hedge was planted by the community to separate the playground from the adjacent car parking. Timsbury pre-school, who are based in the village hall for four days a week, wanted an external space to allow the children to play and explore the outdoor environment. They approached the village hall committee who agreed that a space could be provided which could offer more than just a children’s playground. LandShape worked together with the committee, the pre-school and the local residents to provide a multi-use garden, with enclosable space for preschool use which then could be open to all during other times. 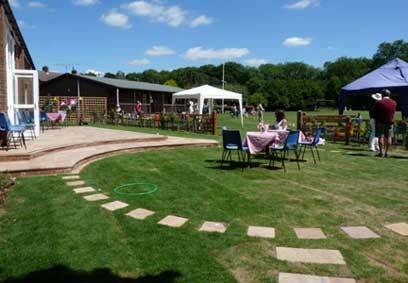 A stone patio was provided with accessible ramps to allow an outdoor space for functions plus benches for people to sit and enjoy the sun and the view over the cricket pitch.